FERGUSON, Mo. – The high level of tension in the town resulting from the Aug. 9 police killing of an unarmed Michael Brown, 17, has created an extremely volatile situation here. Local residents who witnessed the fatal encounter mentioned that Brown, after being ordered to get off the streets by a police officer, raised his hands to show he was unarmed but was nevertheless fired upon by the officer. It is reported that Brown’s body was left lying on the ground for four hours before any EMS personnel arrived at the scene. “We were just walking home, minding our own business,” Dorian Johnson, 22, told NBC affiliate KDSK. The officer told them to “get the f-ck off the sidewalk,” Johnson said. The accounts by police are greatly at variance from those by local eyewitnesses. Jon Belmar, St Louis County Police Chief, said the episode began with, “a physical confrontation.” He did not go into further details about what prompted the next alleged set of events that led to the shooting and death of Brown. Currently Ferguson Police have refused to release the name of the police officer but have stated that the officer is on paid administrative leave as the investigation, now being led by the FBI and Department of Justice, continues. Civil rights activist, the Rev. Al Sharpton, has called on police to release the name of the officer who fatally shot Brown. The family of Michael Brown has retained Benjamin Crump as legal counsel. Crump served in that capacity for the family of Trayvon Martin. On the heels of the tragedy thousands of community members, both black and white, marched to the Ferguson Police Headquarters on Sunday morning, demanding justice for Brown, the immediate arrest of the unknown officer, and answers as to why this had to happen. The pain and sadness felt by Brown’s parents and the entire community cannot be described by words. Only the images from that scene will do. As the sun set over the crowd, the sadness and pain transformed into anger and resentment as police began to increase their presence with city, county, highway patrol, tactical swat, and K-9 units. It was a scene reminiscent of the South in 1968 during the historic struggles for civil rights. Although the demonstrators were mostly peaceful, there was looting that went on through the night and into Sunday morning. Monday morning came quickly and greeted many sleepless residents as the reality of all the events that had taken place began to set in. Community, faith, labor and social justice activists from all walks of life regrouped and gathered once again outside of Ferguson Police Headquarters for a morning of peaceful protest. Hundreds gathered and with one voice marched up the street shouting, “Hands up! 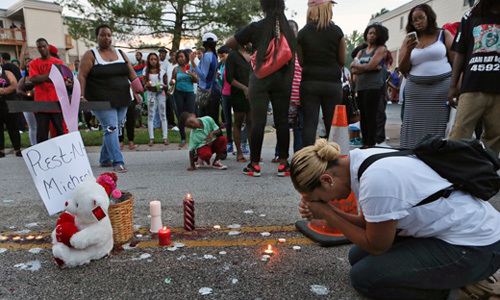 Don’t shoot!” – calling attention to Michael Brown’s last act. Despite the heavy police presence the people remained calm as they called for peaceful demonstrations and justice Around 11:30 all those who had gathered returned to their cars and began a more-than-one-mile-long funeral procession. Mothers stood together in support of Michael Brown’s mother as if they were all Michael’s mothers at that exact moment in time. Young NAACP activists called for an end to the violence and the destruction of their local community. The air in the room was filled with grief, commitment, and hope. As the meeting came to a close, social media began to report that violence was on the rise again in the W. Florissant and Ferguson Ave area and the room quickly dispersed as community members headed home quickly to prepare for another long night. Two other shootings – one by police who critically wounded a man – have been reported. Police blocked all approaches to that location and quickly escalated their tactics to include tear gas, rubber, and wooden bullets. The anger and pain again manifested itself negatively in this small community. Sharpton, who held a Tuesday news conference with Brown’s family, also pleaded for protesters to remain peaceful. Sharpton described Brown as a “gentle giant.” He said that to become violent because of his death is to betray his name. John Wojcik contributed to this story. Al Neal is a sports columnist for People’s World writing on politics, labor relations, and the general ruckus in professional sports. He spent a decade working in the trade union movement with various locals across the country and currently serves as Dir. of Education and Advocacy for the St. Louis Workers’ Education Society. 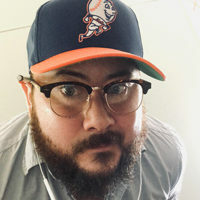 A member of the Society of Professional Journalists, the National Sports Media Association, National Society for Newspaper Columnists and the NewsGuild, Neal’s work and reporting has been featured in the Labor-Tribune, Buzzfeed News, Russia Today (RT), Sputnik News Wire, and Getty Images. More words at GrandStand Central.